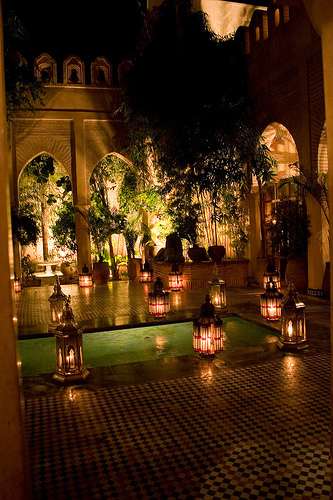 Riad Porte Royale Location. 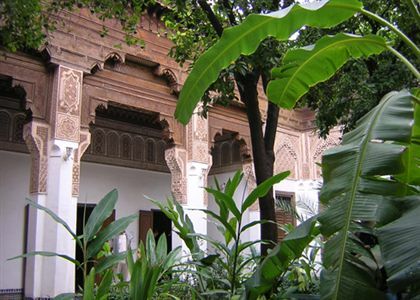 Book Riad Porte Royale Today with Hip Morocco - Holiday Accommodation in Marrakech, Morocco. 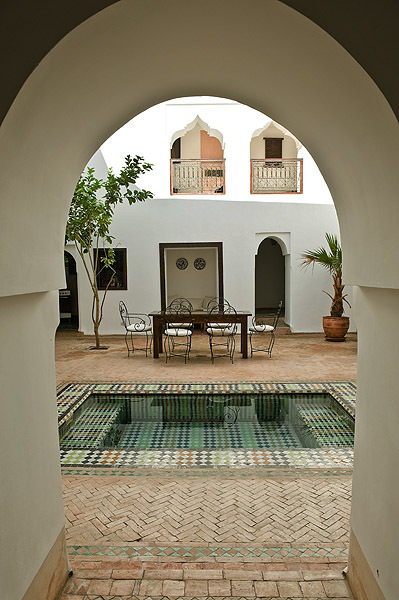 "White and harmonious, devoid of heavy ornamentation, a perfect tonic to a day in kaleidoscopic Marrakech..."
Located west of the beautiful Mosque of Sidi-bel-Abbès in a friendly residential quarter of hidden mansions, palaces and boutique hotels, Riad Porte Royale provides an authentic Moroccan experience. 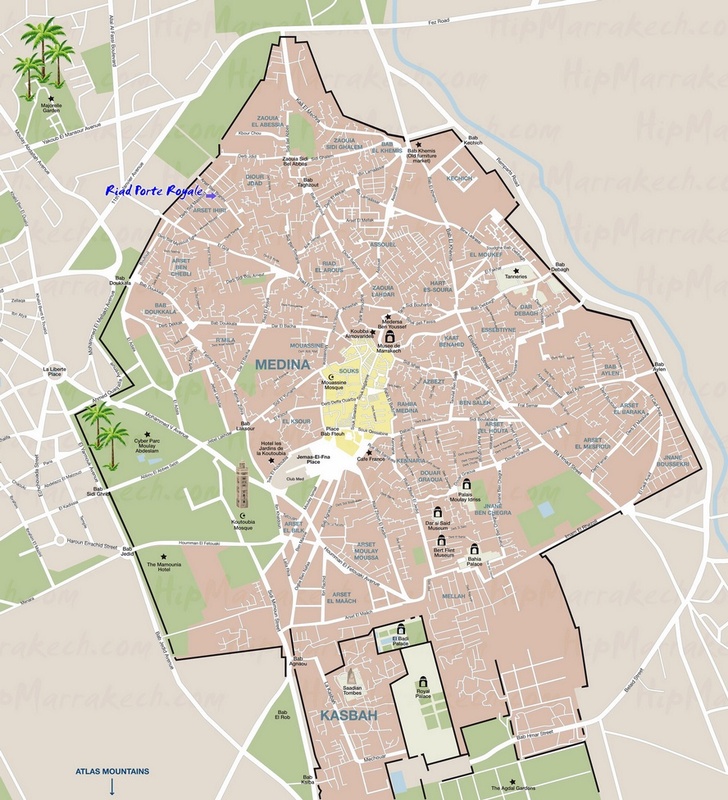 Situated near the ramparts, Riad Porte Royale is easily accessible by car, but only a few minutes stroll from fine restaurants and all the best things to see and do in Marrakech. 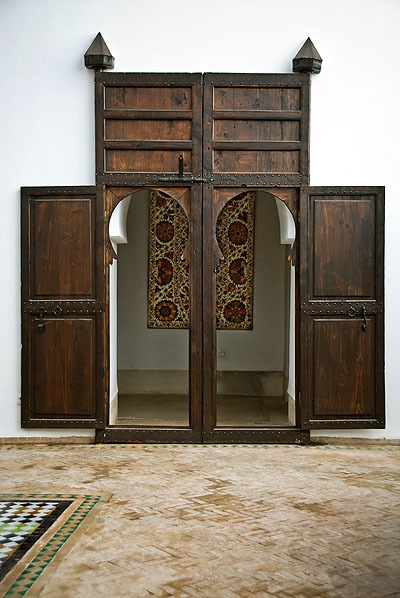 Dating back to about 1750, Riad Porte Royale has been restored by master craftsmen using traditional and authentic techniques. 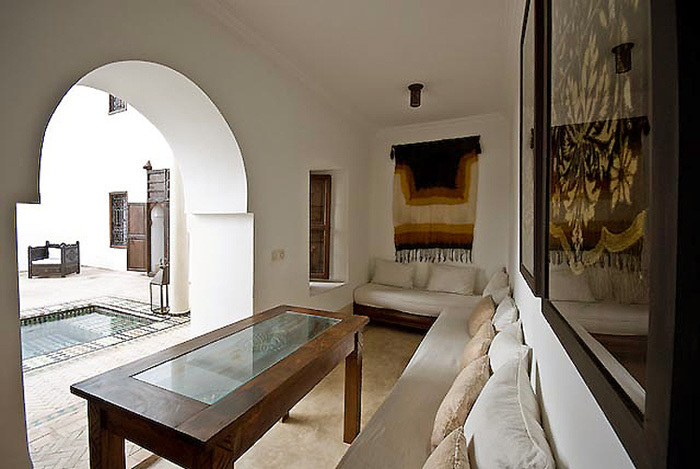 Today the riad incorporates all of the traditional finishes and authentic Moroccan features, such as the thick walls, combined with all the modern comforts of modern life. 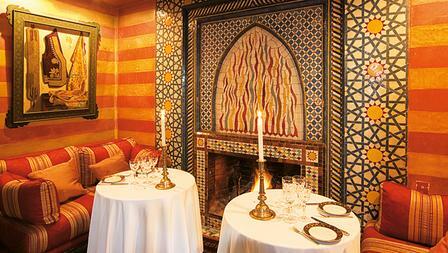 Textiles, rugs, and objects d'art from the old caravan routes of Asia and Africa accent the five en-suite bedrooms. 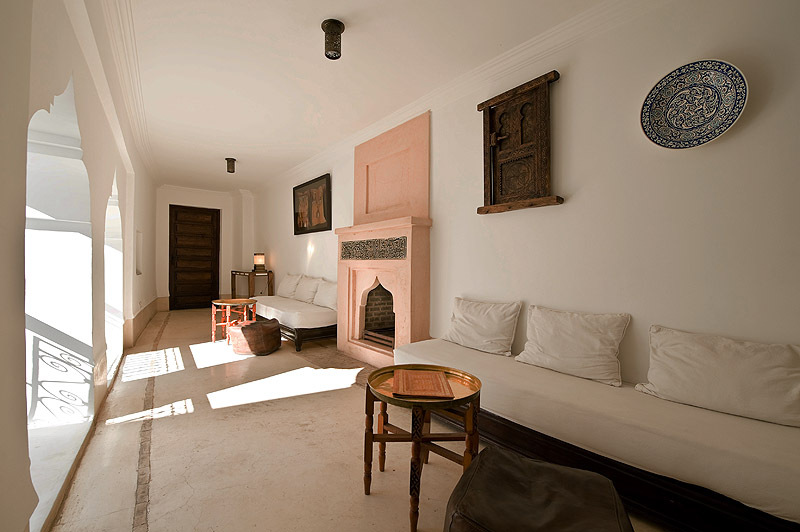 Elsewhere in Riad Porte Royale, there are several corners to relax in, from the b'hou off the courtyard, to the upstairs loggia with its fireplace and pretty window arches. 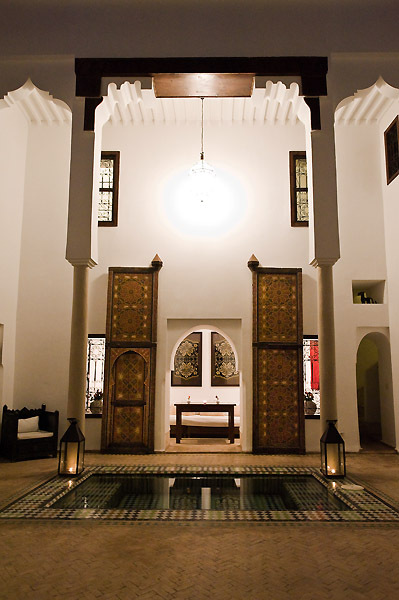 The riad also features the luminous courtyard, the dipping pool mirrors the dramatic portico and the ancient 'porte royale'. 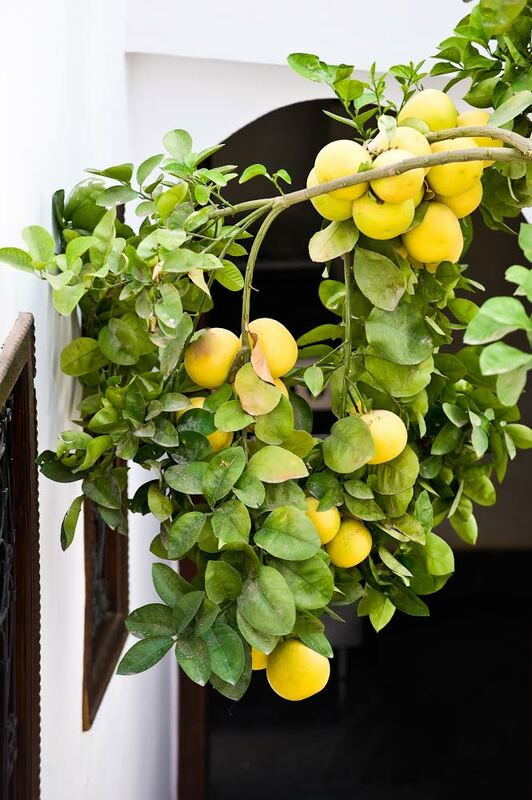 Standing nearby, a single grapefruit tree adds to a sense of harmony and tranquility. 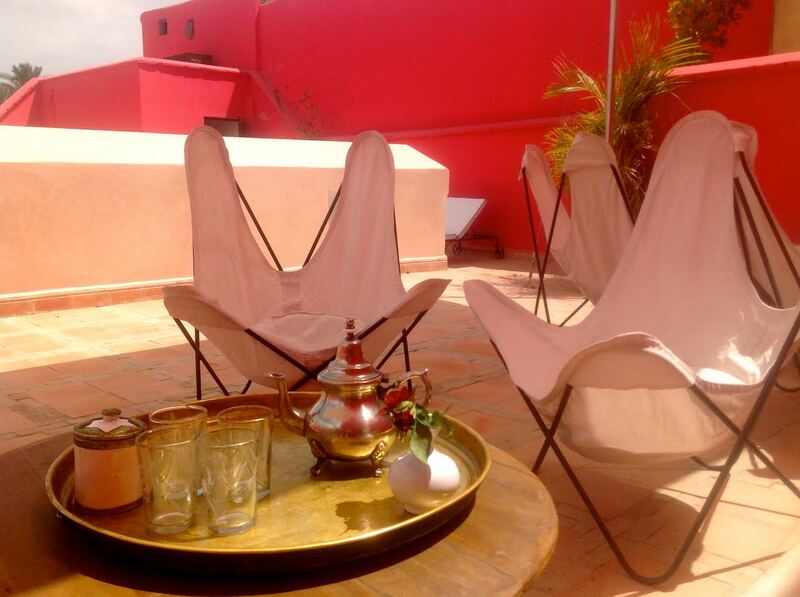 You could also enjoy the tent on the roof terrace of Riad Porte Royale with a view of nearby palms. Breakfasts are included for all rooms. Water, tea and coffee are also complimentary. With a few hours notice, our excellent cook can provide a light lunch or a Moroccan dinner, and there is a vegetarian menu, all at a reasonable rate. Meals can be served anywhere, in the courtyard, the salon, the loggia, or on the terrace. The manager, Mohamed Elaadi, speaks English, French and Arabic. 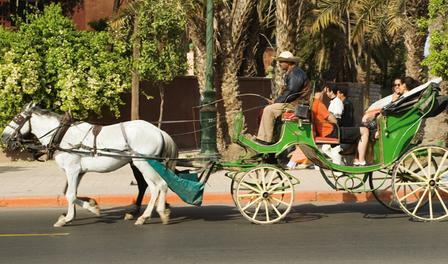 He is available to arrange excursions or make reservations. "I'd just like to say how much I enjoyed my stay at Porte Royale last week. 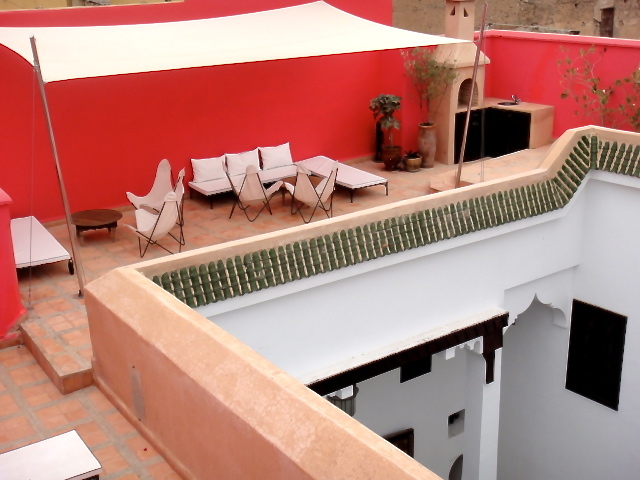 Your Riad is simply stunning, you have both created a fantastic place to stay in a very cool city!" "Can I say a big thank you to Mohamed & Hajiba who both made me very welcome and went out of their way to help me at every opportunity. It was also a real pleasure to meet Maria, who was lovely and a great host. 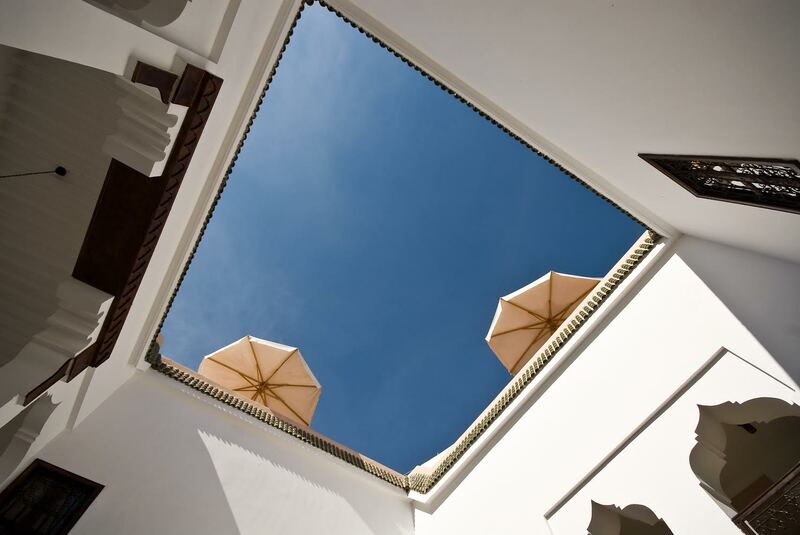 I'd love to return to Marrakech again soon, and couldn't think of anywhere I'd rather stay..."
Riad Porte Royale is located close to the Western Ramparts of the Medina, two minutes walk from the beautiful mosque of Sidi-bel-Abbès, the patron saint of Marrakech. It is set in a quiet and friendly residential quarter of hidden mansions, palaces and boutique hotels and is easily accessible by car. 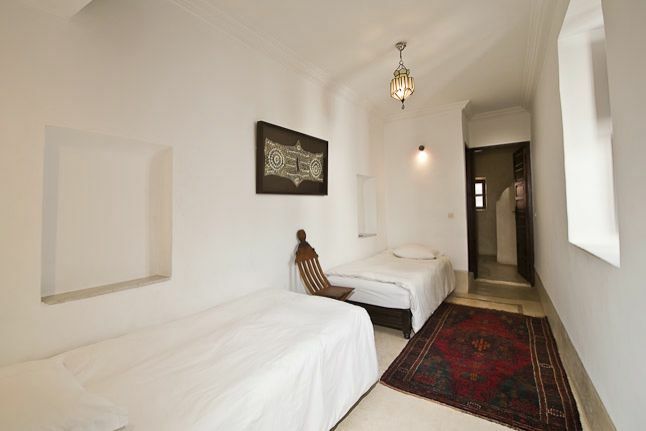 In this double bedroom the pure clean lines of white walls combine with neutral tadelakt and bejmat floors to create a calm and relaxing ambience. Hanging on the warms are objets d'art from the Dogon people of Mali and the Warka Tribe. 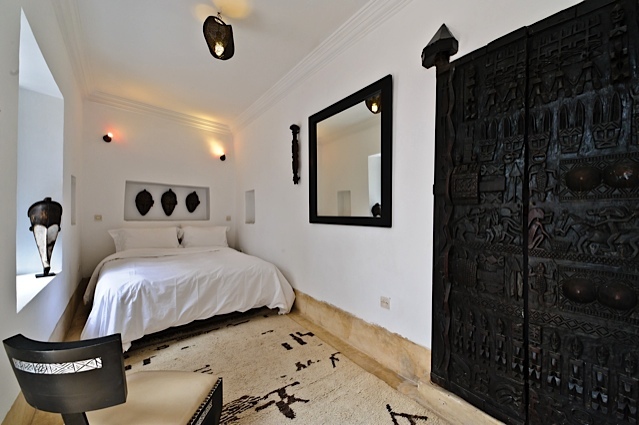 The old wooden doors of the African Room open onto the courtyard.The bathroom is in tadelakt, with a nickel sink, and an external window. Room features: Reversible air-conditioning, en-suite. Named after the famous 14 century Moroccan traveller, this double or twin rooms features a window screen from Rajastan, an old Chinese cabinet, and a Syrian-style lamp. 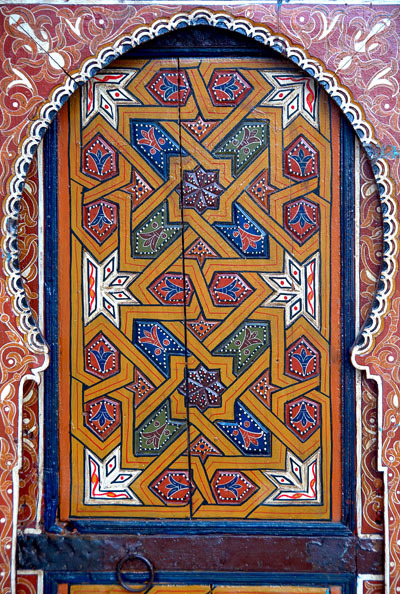 The traditional cedar doors of the room open onto the courtyard. 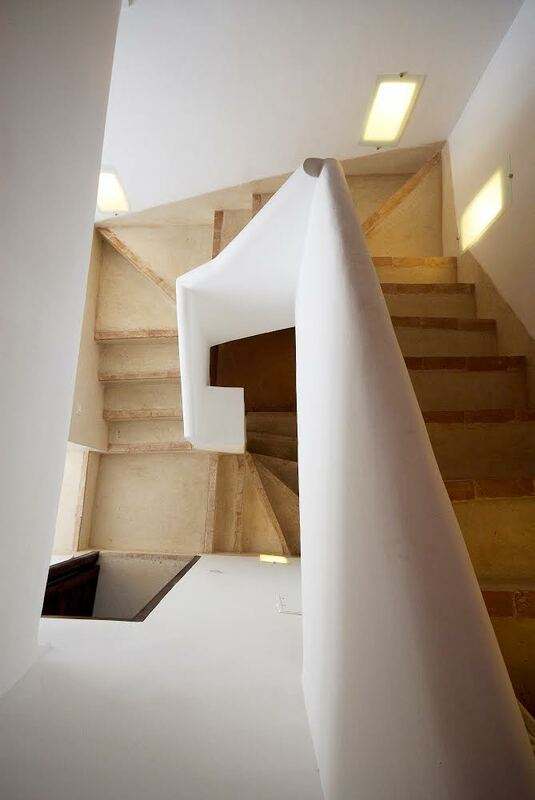 The en-suite bathroom has a ‘cocoon’ shower in tadelakt, a nickel sink and an external window. 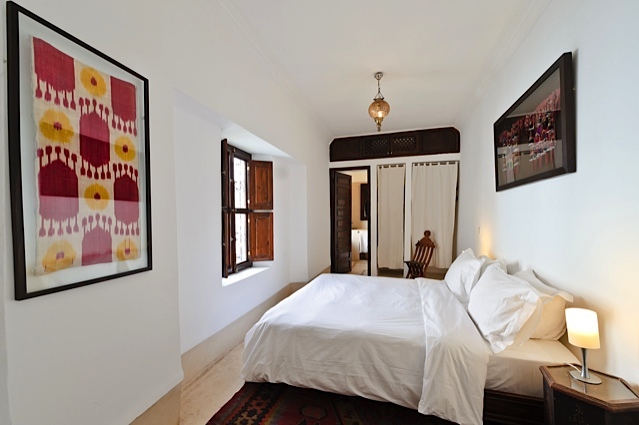 Located off the loggia on the first floor, this air-conditioned twin bedroom offers pure clean lines, white walls combined with neutral tadelakt and bejmat floors. This calming ambience is enhanced by the rich colours of an old Baluchi rug, which complement the child’s ceremonial ‘chain mail’ smock from Uzbekistan framed on the wall. 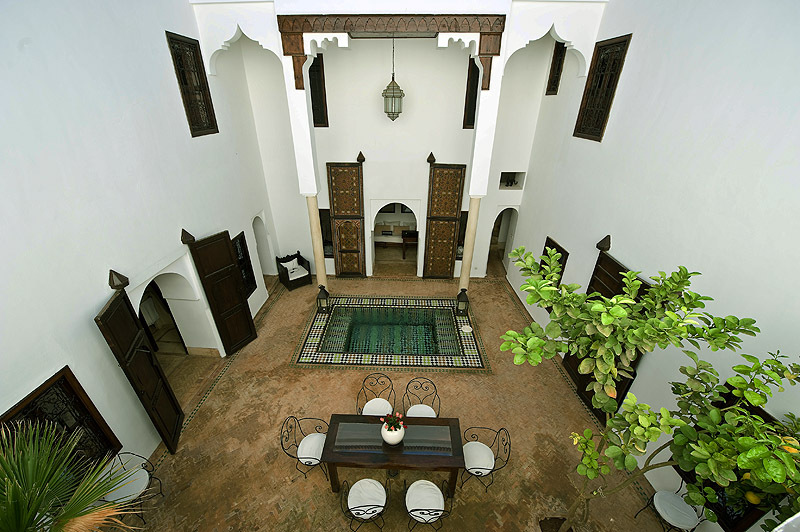 The large bathroom has a tadlakdt shower, a nickel sink, and two windows, one to the courtyard, and a small one to the ‘derb’ or lane leading to the back door of the riad. Off the loggia on the first floor, this air-conditioned twin or double bedroom is the perfect space to relax and unwind. The white walls combine with a neutral tadelakt and bejmat floor, enhanced by the rich colours of an old Caucasian kilim or flatweave. A child's ceremonial smock and an ancient fragment of Ikat from Uzbekistan on the wall. 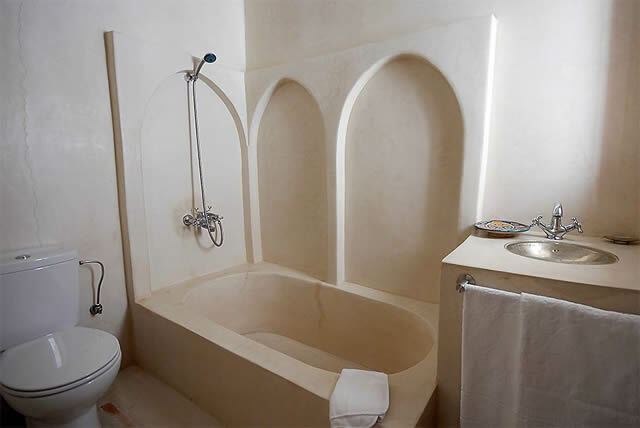 The tadelakt bathroom has a large shower, an old Moroccan mirror above the nickel sink, and an external window. 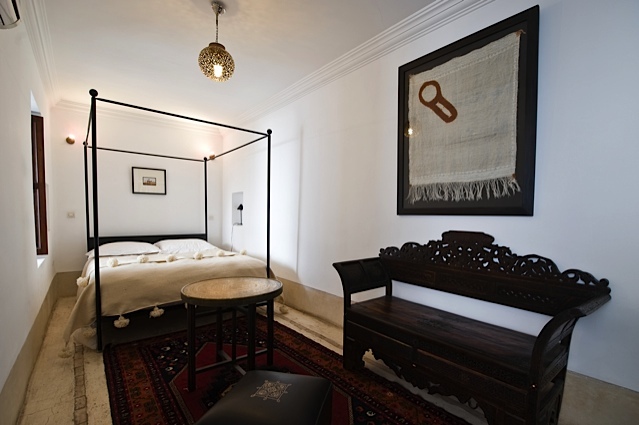 Reached by a 'secret staircase' it is the riad's most private room, and with a four-poster bed, perfect for honeymooners. The pure clean lines of white walls combined with a neutral tadelakt and bejmat floor, are enhanced by an old Turkish rug woven as a dowry piece, and in a frame a rare wedding scarf from the Moroccan Atlas. 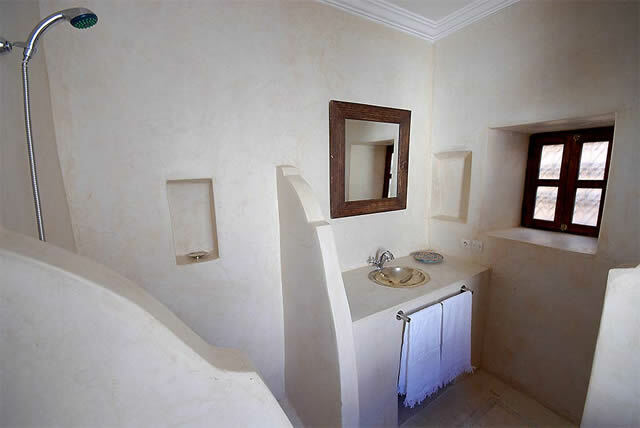 The Douiria room has reverse air-conditioning, and the large en-suite tadelakt bathroom has a bath with shower and external window. 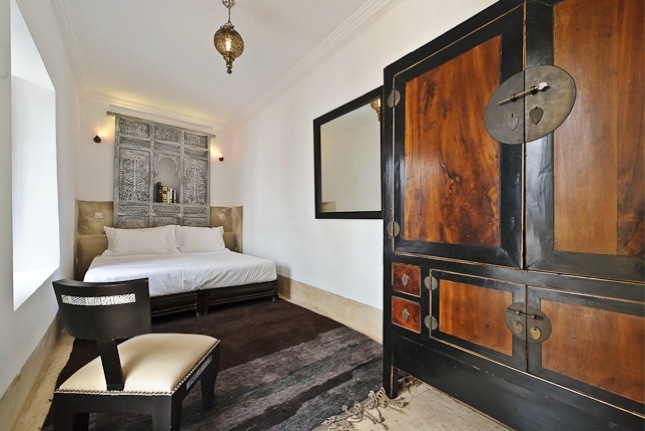 Riad Porte Royale is available for exclusive rental, gifting guests full use of the five spacious rooms. * A minimum stay of three nights is required. 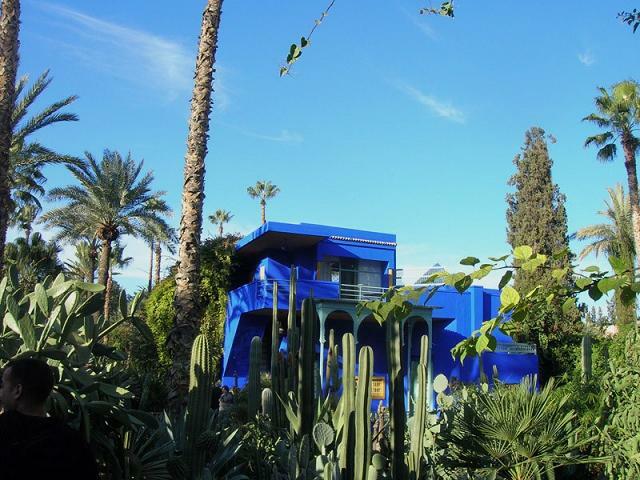 The base rate price at Riad Porte Royale is in pounds, euros, or Moroccan dirhams and exchange rates are approximate.